The Cincinnati Bengals will open their training camp, having made the least amount of noise in the quarterback room among AFC North teams this offseason. Lamar Jackson has been loudly touted as a Joe Flacco replacement should Flacco hit a speed bump during the Baltimore Ravens’ season. Baker Mayfield, who will likely start the season behind Tyrod Taylor, will still join the long list of starting Cleveland Browns quarterbacks sooner rather than later. And Mason Rudolph was taken high enough in the draft for Pittsburgh Steelers fans to speculate just how long Ben Roethlisberger has at the helm of the Steelers’ dynamic offense. That leaves Andy Dalton and … Matt Barkley along with a few project signal-callers for the Bengals. While Dalton certainly needs a bounce-back year, there’s no quarterback controversy in Cincinnati – at least not yet. 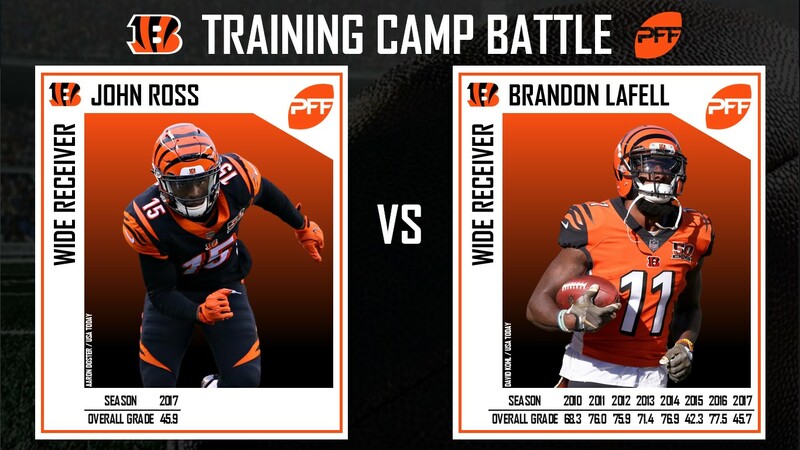 The Bengals’ training camp kicks off with rookies reporting June 23 and veterans showing up June 25, and the main focus will be their offensive line. 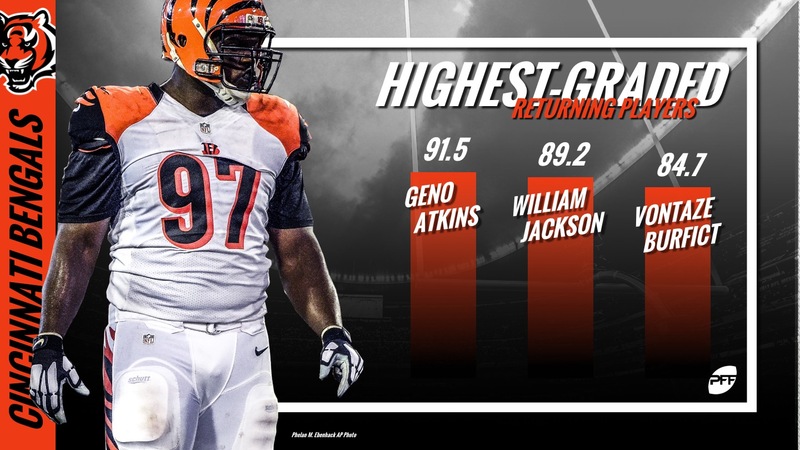 Cincinnati does bring in a talented defense returning from a season ago, headlined by All-Pro Geno Atkins. Noticeably absent from that list of returning players is an offensive player, and specifically, an offensive lineman. The Bengals’ first-round pick – center Billy Price – wasn’t the flashiest selection, but it was much needed. Russell Bodine, the 2017 starter in the middle of the line, struggled mightily in the run and pass game. Without PFF data, it appears Bodine had a successful campaign by allowing just one sack – a career-best. With PFF data, it’s clear Bodine had a rough year by allowing the 12th-most pressures (18) and the sixth-most hurries among centers (16). His run-block grade of 46.8 ranked 24th of 34 qualifying centers. And fortunately for the Bengals, Bodine is now with the Buffalo Bills. On the flip side – and the brighter side – Price graded at 83.8, tied for 17th among NCAA centers during the 2017 season with the Ohio State Buckeyes. His run-blocking prowess was what really shined this past season. When rushing directly right or left of Price in 2017, runners averaged 7.9 yards per carry. Those unfathomable numbers won’t show up at the NFL level, but Price’s sheer run-blocking talent will undoubtedly be an asset to what was an objectively dreadful Bengals offensive line. To put things simply, Price essentially just needs to show up to training camp to secure the starting center role. The Bengals’ 2017 offensive line woes led to a trade for left tackle Cordy Glenn in the offseason, a move that was desperately needed. Cedric Ogbuehi was slotted in the position last year and was one of only eight tackles to allow eight or more sacks. He also finished 66th of 81 tackles in pass-block efficiency, so it’s no secret that Glenn is an upgrade. But the bigger question for training camp is how well the new offensive line will gel. With all the resources that have now been invested into it with the additions of Price and Glenn, there’s no excuse for anything other than imminent improvement. Even with the expected upgrades at left tackle and center, the right tackle position is still a question mark. It’s up for grabs among Ogbuehi and Jake Fisher, both of whom were liabilities in 2017. Both finished with PFF grades below 50.0, and both finished in the bottom-15 in run-block grades among tackles. Suffice it to say, it isn’t pretty. Their battle for the right bookend position will come down to who meshes best with the other pieces, because neither Ogbuehi or Fisher has proven better than the other. If Dalton is going to impress in 2018, he’ll need the help of more than just A.J. Green. Second-year WR John Ross struggled with injuries scattered throughout 2017 and was surprisingly scratched for many of the games he was supposedly healthy for. First-round wide receivers are quick to be labeled busts if they don’t produce immediately, so Ross needs to find his footing in training camp and the preseason if he is to rebound. The outlook is still promising because of his off-the-charts college production. In 2016, he was 20th among 264 qualifying NCAA receivers in yards per route run (3.05) and his passer rating when targeted of 131.7 was 16th among those 264 receivers. However, Ross will be back to square one entering training camp and he’ll need to show that his college abilities haven’t diminished. Should Ross make a splash this offseason, he could even take Brandon LaFell’s spot as the No. 2 receiver. Ross’ lost season shouldn’t worry Bengals fans too much – just look at Nelson Agholor’s emergence in 2017 after two forgettable seasons. Now is John Ross’ time to shine.